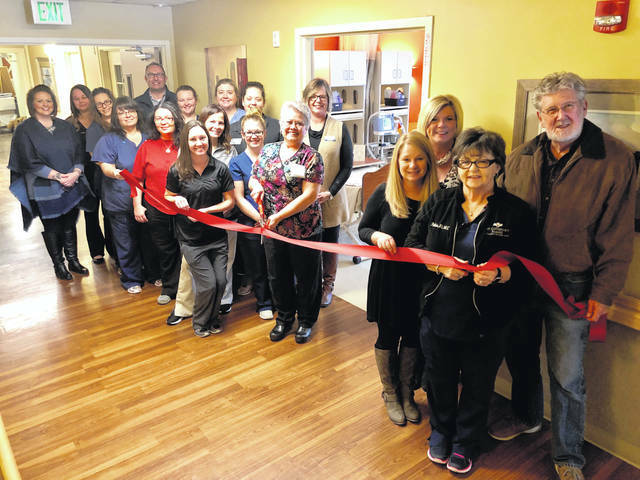 The Fayette County Chamber of Commerce Ambassadors, as well as staff of St. Catherine’s Manor of Washington Court House, cut the celebratory ribbon on the new Ventilator Care Unit, Thursday, Jan. 17. Located at 250 Glenn Ave., St. Catherine’s will utilize state-of-the-art equipment to aid in the weaning of ventilator care, as well as care for those with tracheostomy, BI-PAP, C-PAP, and chronic respiratory conditions. Sue Pitzer, RRT, will bring her over 30 years of experience to St. Catherine’s as she leads the pulmonary enhancement program. Congratulations to St. Catherine’s Manor as they open this state-of-the-art care unit. Those interested in respiratory care for themselves or a loved one are encouraged to call the facility at 740-335-6391.
https://www.recordherald.com/wp-content/uploads/sites/27/2019/01/web1_IMG_2621.jpgThe Fayette County Chamber of Commerce Ambassadors, as well as staff of St. Catherine’s Manor of Washington Court House, cut the celebratory ribbon on the new Ventilator Care Unit, Thursday, Jan. 17. Located at 250 Glenn Ave., St. Catherine’s will utilize state-of-the-art equipment to aid in the weaning of ventilator care, as well as care for those with tracheostomy, BI-PAP, C-PAP, and chronic respiratory conditions. Sue Pitzer, RRT, will bring her over 30 years of experience to St. Catherine’s as she leads the pulmonary enhancement program. Congratulations to St. Catherine’s Manor as they open this state-of-the-art care unit. Those interested in respiratory care for themselves or a loved one are encouraged to call the facility at 740-335-6391.